Now here's a catfish that stands out from the multitudinous ranks of its peers. You can't pick up a catfish book without initially reading about how varied and adaptable catfish are, and this month's catfish is one of the reasons why. Here is a very "keep-able" inoffensive fish that has one fascinating feature - it lives its life upside down. 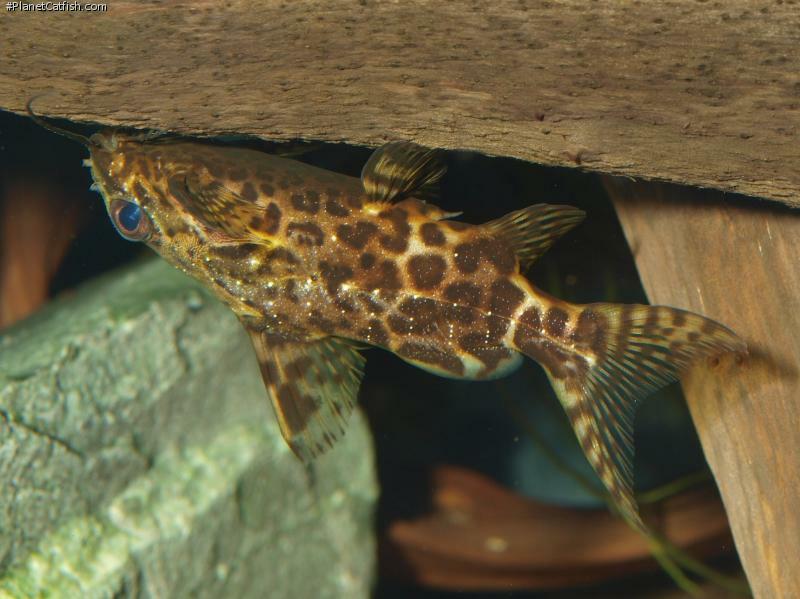 The are only two other species of catfish known to man that share this behaviour, one is the similar but much rarer Synodontis contracta and the beautiful and vicious Asian Upside Down Catfish (USD), Mystus leucophasis. There are other species (amongst them other Synodontis species and some Plecos) that assume the inverted state for varying periods of time, but these 3 are the only ones that spend virtually all their time upside down. The give away feature is the fishes dark belly. Most fishes have light undersides, a feature developed by them in order to escape detection from predators lurking beneath them. The light, usually white underside against the light water surface makes for a less obvious target. The USD catfish is uniformly patterned even on its belly. The photograph above shows the species in a "normal" swimming position showing the, if anything, lighter back and darker underside - a totally reversal of normal shading. In the wild these fish are found in huge shoals of several thousand fish. To get the most out of these fish in captivity you have to keep them in good sized shoals - like you would keep Corydoras sp. Although if kept alone they will prosper, they are downright reclusive. Given a fairly shady tank with lots of overhanging retreats a shoal of this species will spend a good deal of the time out and about - much more rewarding for the aquarist, and the fish are obviously more settled too. suggest it for a place in a medium sized community tank especially when you consider that they also do a very god job of finding food that other inhabitants missed. This feature in addition to their hardy nature also means they can withstand the attentions of some of the more boisterous medium sized Central American Cichlids (Firemouths, Convicts etc.). But beware - these catfish are also very efficient egg eaters! Etymology Synodontis: From the Greek syn, meaning together, and odontos, meaning tooth; in reference to the closely-spaced lower jaw teeth. nigri mean dark, ventris meaning belly. Alluding to the reversed counter-shading. A common import; although occasionally confused with the similar S. contracta which has a larger head and much larger eyes. Sexing Female is larger, plumper and with old age more pale. Distribution Africa: Democratic Republic of the Congo. Feeding Will eat the vast majority of prepared and live foods. Furniture Over hanging structures or tunnels - either rock, wood or large broad leafed plants. These are all to provide shady places of rest while upside down. Choice of substrate is unimportant. Compatibility An ideal catfish for the smaller aquarium. Peaceful with both its conspecifics and other residents. To get the best out of this fish it should be kept in small shoals as you would keep Corydoras. Suggested Tankmates Any small to medium sized community fish. There are 182 registered keepers, view all "my cats" data.